A newly introduced preservation fluid is designed to provide long-term protection for subsea equipment components and interface profiles. The environmentally friendly Defender Stasis LT from Universal Subsea Inc. (USI) is a lightweight, nontoxic, biodegradable preservation fluid that is compatible with all commonly used metals and nonmetallic materials in oilfield service. USI said it identified the need for the product during the development of its nonmetallic, low-pressure, subsea isolation cap product line. The company needed a lightweight preservation fluid for subsea wellheads and trees for long-term use, temporary abandonments and permanently abandoned wells, but found commercially available fluids exhibited high toxicity, potential for elastomer attack, improper specific gravity, elevated flammability or undesirable sheen-forming properties. “Subsea wellhead preservation fluids are discharged directly to the marine environment. We wanted a fluid that would be completely nontoxic to aquatic life while providing the lowest overall environmental impact,” said Sean Thomas, P.E., General Manager, Universal Subsea, Inc. Combined with its low-pressure isolation cap technology, USI said it has the first comprehensive solution to protect subsea wellheads and subsea tree mandrels from corrosion, calcareous deposits and marine growth. While corrosion and marine growth are well known problems in water depths up to 762m, the issues with calcareous deposits on wellhead and tree ring gasket profiles are not as well understood in the industry, according to USI. Because of the widespread issues with calcareous deposits, remotely operated underwater vehicle (ROV) crews must scrub the ring gasket profile nearly every time an operator performs an intervention to a subsea well. These field cleaning activities are accepted as standard practice, yet they pose a significant likelihood of creating out-of-tolerance conditions for the very precisely machined ring gasket profile. After one lengthy cleaning operation or several cleaning operations of shorter duration, there is substantial risk that the liquid-sealing performance or gas-sealing integrity of the well may be permanently damaged, USI said. Another widespread problem is the corrosion of large equipment assemblies and running tools. Large pieces of subsea equipment often retain residual water in the internal bores from pressure testing or condensed humidity, which can cause corrosion and reliability problems. Defender Stasis LT can be used to protect the internals of subsea trees, subsea manifolds, jumpers, flowlines and PLETs/PLEMs during shipping, storage or wet parking. The fluid is rated as a fire-resistant hydraulic fluid because of very low volatility with a high flash point and high fire point. It has negligible toxicity in the event of personnel exposure and is rated as a negligible hazard or minimally toxic for all personnel ratings. 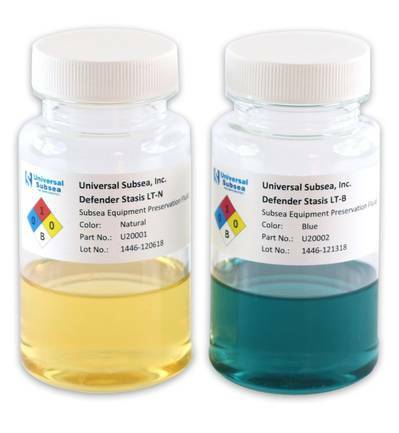 Defender Stasis LT is recyclable and can be reprocessed to its original specifications. For shipping or storage applications where the preservation fluid is recovered after use, customers can choose to recycle the fluid rather than paying for disposal costs. This option not only avoids disposal costs, but also provides significant cost savings for the recycled fluid compared to the cost of new preservation fluid, USI said.